The record is made up of 1 volume (37 folios). It was created in 1943. It was written in English. The original is part of the British Library: India Office The department of the British Government to which the Government of India reported between 1858 and 1947. The successor to the Court of Directors. Records and Private Papers. 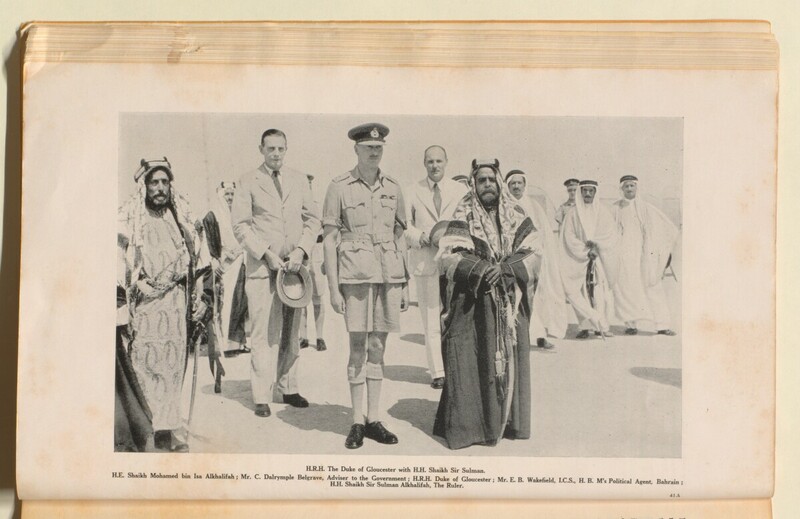 This volume is the Annual Report of the Government of Bahrain for the year 1361 AH (1942-1943) and gives te details of the Revenue and Expenditure of the Bahrain State and contains notes on the activities of the various Government departments, as well as the budget 1362 and some particulars of importance which took place in Bahrain during the year. It includes text, photographic images, graphs and tables. The report appears to be compiled from reports from various Government departments and officials. An index appears on folio 240r, followed by a General Review by Charles Dalrymple Belgrave, Adviser to the Government of Bahrain, dated 19 May 1943 (folios 243v-244r). Note on Budget 1362 (folio 274r). Folio 262: 'H.R.H. The Duke of Gloucester with H.H. Shaikh Sir Sulman'. On folio 274v there is an inscription that reads 'The Times of India Press, Bombay'. This file contains an index (folio 240r) which references pages of the report.